Buyers will be able to connect with their inner Picasso—Pablo or Paloma—in the Art Studio, which may include easels for painting, wall space for canvases, a stone surface for sculpting, a table for jewelry making and beading as well as a working sink. There is also a wall of light that imitates north faced natural light, which is optimum for art, 24/7. Additionally, the space will boast a library filled with art books for inspiration. “I liked the idea of having a simple and calm space. A quiet room to create,” said Lissoni. 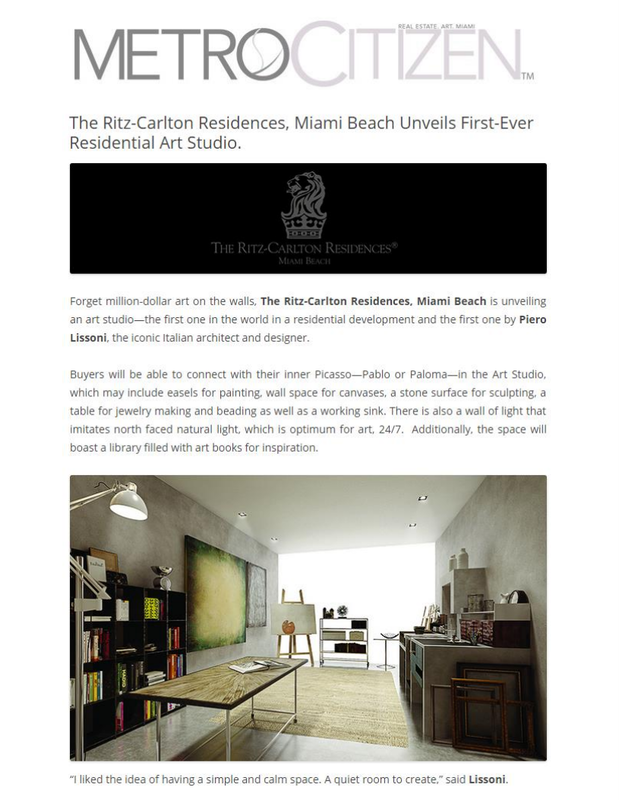 “Condominium developments have media and gaming rooms but no rooms for artistic expression,” noted Ricardo Dunin, founding partner, Lionheart Capital, the developer of The Ritz-Carlton Residences, Miami Beach, which is now more than 50 percent sold at prices that range from $2 million to $40 million for the Lissoni-designed condominium residences and single-family villas. “There is a need in society now for more hands-on creative work. You don’t have to be a professional artist to do art, the same way you don’t have to be a professional basketball player to play basketball,” continued Dunin. Residents will also have the opportunity to draw inspiration from The Residences’ seven acres of tropically-landscaped gardens, pools and private boat dockages set on a quiet corner where lake, ocean and waterway meet. Art Studio programming will include private and group classes, art talks and trips, and onsite exhibits of residents’ work.